Captain Phillips is based on the true story of an American cargo ship hijacked by Somali pirates. 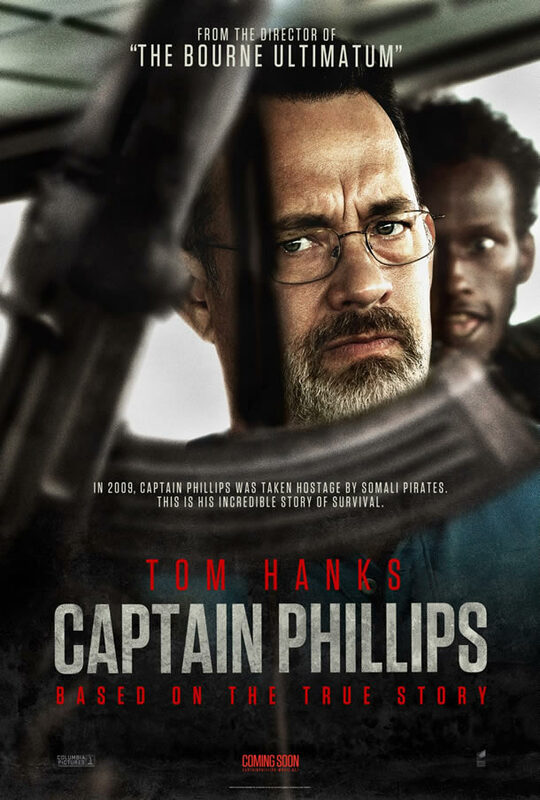 After seeing American Hustle and The Wolf of Wall Street, Captain Phillips was a complete change of pace. I watched this the same day as The Wolf of Wall Street – just a few hours apart – and the difference between the two was almost jarring. Captain Phillips was intense and suspenseful. It wasn’t as big or elaborate a production as the first two movies I’ve watched – the cast was smaller, with most of the second half focusing just on Phillips and the four pirates in the lifeboat. I loved the way they filmed the movie; there were so many closeups, increasing the intensity and drama of the film. Even sitting in my living room I was starting to feel a little claustrophobic during the scenes on the small, enclosed lifeboat. After watching this film I was a little surprised Tom Hanks didn’t receive a Best Actor nomination, but I’m really glad Barkhad Abdi was nominated for Supporting Actor. He was fantastic as, Muse, the leader of the pirates who attacked the cargo ship. This was his first acting experience, which makes his role in the film ever more impressive. Of the films I’ve seen so far I think I would pick him over Bradley Cooper or Jonah Hill; I have a feeling his toughest competition will be from Michael Fassbender or Jared Leto. Captain Phillips: There’s got to be something other than being a fisherman or kidnapping people. Great post! I loved Captain Phillips and yes, Tom Hanks was robbed a nomination! I’d pick Hanks over Bale in a heartbeat. And I actually expected Greengrass to snag a directing nomination, but to be fair, 2013 was one hell of a year for film and therefore there were plenty of snubs.